I am really loving the buckwheat flour I bought awhile back and I've been experimenting with recipes. Buckwheat has a sort of earthy-nutty taste and a lovely pale blue hue. Buckwheat is not actually a wheat at all, so it's gluten-free. It's high in protein, fiber, and amino acids. 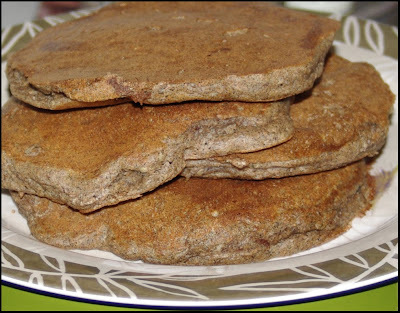 Since buckwheat does not have gluten, these pancakes were very tender, almost delicate, but dense at the same time. I added a bit of my sourdough starter to the recipe to get the pancakes to puff up a bit. Since these pancakes are somewhat on the fragile side, keep them small when pouring your batter. Since I really like the taste of buckwheat, this is a recipe I'll make again. I think I'll try adding some amaranth flour in place of part of the buckwheat since I love the nutty sweetness it gives to baked goods. These pancakes go well with maple syrup, but I like them topped with just a bit of powdered sugar best. Hello Michele...interesting to make these with buckwheat...I'm still experiementing with gluten-free flours. So far my favourites have been Sweet Sorghum and very fine Rice flours. I wasn't to sure about the Amaranth. I may just give that a try next. A little trick I use to fluff up my pancakes...beat the egg white apart and gently fold it into the batter. I tried it with the S.Sorghum flour very successfully. Get out! I didn't know that buckwheat wasn't wheat! Your pancakes look puffy and delicious!